Community Colleges continue to evolve, and as they do they experience new struggles with accountability measures, the increase in student diversity and financial constraints. Despite these intensifying demands, community colleges continue to seek ways to bolster student retention and graduation rates. A Matter of Degrees: Engaging Practices, Engaging Students, a report released today from the Center for Community College Student Engagement (CCCSE) provides an in-depth analysis of what is working (and not) at community colleges. The report provides key practices for college leaders who are targeting ways to improve student success (retention and graduation). With dwindling resources readily available, educational leaders can utilize this report to target educational approaches that will impact students’ experiences and their success. CCCSE research confirmed potentially valuable elements of student success based on the quality (design and implementation) of educational practices and programs on campus, the number of students participating in the programs and the integration of programs into the lives of the students. Findings revealed that student engagement with on-campus activities was critical to student success. CCCSE identified a dozen community college polices and practices that had a high impact on student engagement and ultimately their success in college. Findings reveal that community colleges offer multiple structured high-impact programs for students to engage in, yet only a few colleges actually require students to attend, and students rarely participate on their own. For example, 84 percent of colleges offered student success courses, but only 20 percent of students responding to the Community College Survey of Student Engagement (CCSSE) and 29 percent of students responding to the Survey of Entering Student Engagement (SENSE) participated. 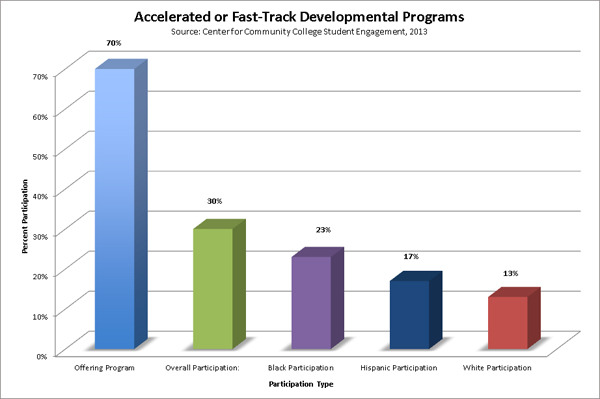 Despite the low level participation, two of the 12 high-impact programs had a higher minority participation rate compared to their White peers – Accelerated or Fast-Track Development Programs and Learning Communities. Seventy percent of institutions offered an Accelerated or Fast-Track Developmental Education program; however, only 30 percent of students participated. Minorities participated at a higher rate than their White peers – 23 percent of all Black students participated, followed by 17 percent of all Hispanics and 13 percent of all White students. Fifty-four percent of community colleges offer Learning Communities; however, only 12 percent of CCSSE respondents participated and 5 percent of SENSE respondents participated. Minorities participated at a higher rate than their White peers –17 percent Black students participated, followed by 13 percent Hispanics and 9 percent White students. Generally across the remaining 10 practices, participation rates are approximately: 30 percent Blacks, 25 percent Hispanics, and 17-22 percent of Whites. What are the Potential Implications on Participation Rates? Community Colleges are becoming increasingly racially-diverse, with over one-third minorities – Hispanics representing 18 percent, Blacks at 15 percent, and Asian/Pacific Islander at 6 percent; and 40 percent who are first-generation college students (2013 Community College Fast Facts). Many low-income students find community colleges particularly appealing because of low-tuition rates at roughly $3,130 in 2012-2013, compared to four-year colleges at $8,660 (2013 Community College Fast Facts). Thus, community colleges have a higher percentage of minorities and low-income students, and need programs that will support these demographics. Kay McClenney, the Director of CCCSE, stated that in general Black students participate in support programs offered by community colleges, followed by Hispanics; while Whites had the lowest participation rates. She speculates that there are three explanations to why this is occurring. First, community colleges are doing the right things to support minority students. Second, minorities often enroll and are not academically ready for rigorous college work. These students are the ones that need the support, and community colleges focus on practices to deploy the support to those who need the assistance. Thirdly, students coming from low-SES or who are first-generation-college-bound have high aspirations for achievement. They tend to work harder to persist and succeed in college, which often translates into more student engagement. CCCSE’s research findings are a general message of hope – students of color are participating in educational support programs at higher rates than their White peers. It is the hope that these community college practices will bolster their success in college and beyond. As the research continues to unfold on community college retention and graduation rates, the “next level solution lies in designing pathways – structured and coherent educational experiences that integrate high-impact practices to establish a clear roadmap for every student” (CSSSE, 2013).